Norman Security Suite is complete security suite for end point protection to protect you while you are surfing on the web, chatting, or getting your email.This security suite includes an excellent firewall and an antivirus program to protect your computer from malicious activities. With viruses and malware more prominent than ever, users need protection from these rogue programs. 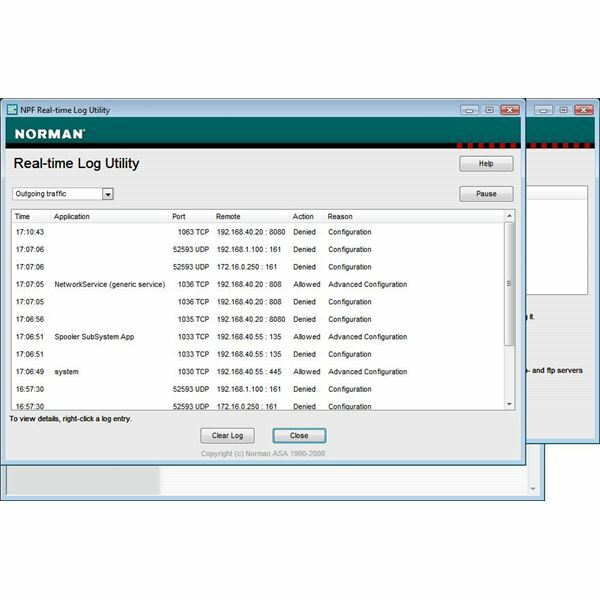 Norman Security Suite’s firewall is highly customizable and provides a live firewall that monitors both incoming and outgoing packets of data. This protection is supplemented with an excellent antivirus and malware program that provides a complete security package. Installation of Norman Security Suite was fully guided. Initialization of the program may have a slight delay while the program checks for other antivirus programs that may be installed. Although the program during this installation appeared to stall, it actually found left over pieces of a formerly installed antivirus program and alerted me of the problem. After a little clean up of the old program, Norman Security Suite installed without error. Alerting an end user that two antivirus software programs may conflict is one of the most important installation processes any software manufacturer can make. Norman Security Suite's installation performed above reproach. The Security Suite also offers an excellent step by step wizard for novice users during the initial startup. Loaded with features, this small program packs a wallop. The firewall feature allows for the total customization of how the end user wants to use their network and what programs can access the network or internet. This component allows for an immediate lock when the workstation is not used. With expert tools available, real time logs provide valuable information of packets entering and leaving your computer. The advanced port viewer shows applications and ports that are being used. This allows a real time view of what most other suites leave unavailable. More advanced features include MAC address filtering and common rules found with MAC addresses on most hardware firewalls. The advanced features of this firewall's configuration offers over 30 addition rules from common applications. Five Stars on this firewall! Excellent! Norman Security Suite's antivirus performed admirable against viruses in a controlled environment. The software can be configured to automatically scan and shows a progress report in the form of a graph. This information can be used to see the overall scanning progress. The antivirus also allows for full control of the user's email program. With an option to filter or block attachments, the antivirus portion of the software can enforce rules before drastic measures have to be taken. The antivirus and spyware program offers protection from instant messaging attachments, viruses, malware and even offers a sandbox. Under a controlled test, Norman Security Suite performed right on the money. To ensure your computer is scanned, a screensaver option is also available. Norman Security Suite is an excellent end point security solution for both small businesses and home users. The interactive firewall provides features that many software firewalls lack. The antivirus and malware protection found all controlled viruses during tests and performed fast and efficiently when identifying the aforesaid viruses. The Security Suite is less than $60 and allows for the installation of up to three computers. At $20 per install computer, the cost is very affordable and well worth the money for the diversified protection. A free trial version of Norman Security Suite can be downloaded from the Norman website. Would you like to read more reviews? Look around Bright Hub and you’ll find reviews of numerous other leading security solutions including SpamTitan, GFI MailEssentials, Atek Secure Password Organizer, GFI LANguard, Norton Internet Security, Panda Internet Security, ESET Smart Security, McAfee Site Advisor and Undelete.